Officially licensed wastebasket. 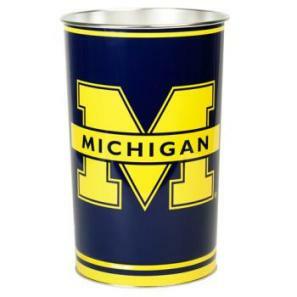 These metal wastebaskets are a great way to decorate a room or office. Wastebaskets are 15" tall by 10.25" diameter and are tapered for easier storage/display and shipping. Made in USA by Wincraft. Prices shown are for 1 single can. Discounts are: (3) or more cans @ $14.50 ea. NOTE: Photo designs shown may not be the current design in stock.